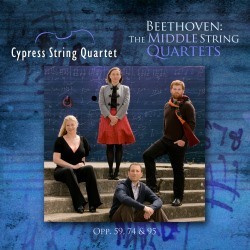 The more I come to listen to this recording of the Beethoven middle period quartets the more I enjoy it. It has grown on me with each and every listen. Unfortunately, it has come at a time when I am re-evaluating the complete quartets as recorded by the Tokyo. Their new recording of the cycle for Harmonia Mundi (HMU 807641.48 - review) is wonderful. I have also been listening to these works as played by the Alban Berg Quartet; not forgetting the versions by the Medici and Belcea. The competition is stiff, and I am afraid there are the odd occasions when the Cypress String Quartet just don’t quite match up to their more illustrious predecessors. That said, they should by no means be rejected out of hand. There are moments of real fluency and panache in their playing; they just have a little less to say at times. It has been argued that it is only with the three ‘Razumovsky’ Quartets that Beethoven really shows his credentials as a composer of quartets, I have always thought that this was erroneous, as there is a lot of fine music to appreciate in the Op. 18. It is never said of the first three symphonies that they only point to the greatness to come but that is what is often implied with the quartets. My argument is that while there is a great development of technique between the Op. 18 and Op. 59, there are echoes of the earlier quartets, if in technique rather than music, in the middle and later period quartets. It is wrong to discount them as they are more than just a developmental tool. The five quartets featured on this set would be very different beasts without the six quartets that preceded them. In the six year period that marked the gap between the publication of these two sets of quartets a lot had happened to Beethoven. The period also saw the publication of arguably the greatest of his early symphonies, the Third, as well as most of his violin sonatas including the Spring and Kreutzer as well as his piano sonatas Opp. 22, 26, 27, 28, 31, 53 and 54. These works charted his progression to one of the most commanding composers of the period. It was these developments in his compositional style that coloured the music of the Op. 59 Quartets. The Razumovskys are more powerful, and in the case of the first two especially, much longer, than their predecessors. As well as this they pose more technical challenges, which I am glad to say the Cypress Quartet answer well. The works themselves were commissioned by Count Andreas Razumovsky, who was the Russian ambassador to the Austrian Court in Vienna. Razumovsky was a keen amateur violinist, who is known to have played the second violin in a quartet that he formed for his own and his friends' pleasure. Whether he ever performed these quartets we will never know. As a result of this commission Beethoven gave the quartets a Russian feel by including themes from a collection of Russian songs by Ivan Pratch. In the trio section of the third movement of the E minor Quartet No. 2, he employs the same melody that was later used to great effect by Mussorgsky in the coronation scene of Boris Godunov. Beethoven however, uses the melody quite systematically, with the subject appearing in each of the instruments. This he does whilst still managing to keep it in its original melodic form. Of all the middle period quartets the Opp. 74 and 95 works are my favourites. Again some seminal works had been composed between the Opp. 59 and 74, including the Fifth Symphony and the Fourth Piano Concerto. The resulting quartets, especially the Op. 95, represent another step forward. They are less expansive and even more difficult to perform than the Op. 59. I well remember a live performance where the quartet were less than together. Thankfully that is not the case here. The Op. 74 gets its nickname ‘The Harp’ from Beethoven’s use of pizzicato in the wonderful first movement. This is full of the ‘Eroica’ character of Beethoven’s middle period. It is however, the achingly beautiful slow second movement Adagio ma non troppo, which is the heart of the work. It is surely one of his finest quartet slow movements. This is followed by an energetic scherzo which can be seen to have an allegiance to the Fifth Symphony. The final movement is cast in the form of a theme and a set of variations. Sheer bliss. The final work in this set and one that would feature as one of my ‘Desert Island Discs’, is the Op. 95 ‘Serioso’. This would sit well among the late quartets — as well as it does here. Its name is derived from the words “Quartetto Serioso” which appear in the manuscript before the third movement. One of the most Romantic of all Beethoven’s quartets, this starts with the shortest opening movement of all the Beethoven quartets, yet it is one of the most concentrated. The second movement offers the listener a more contemplative, yet densely contrapuntal view, before the third, which follows the second without a break, returns the listener to something more agitated and unsettled. It is only in the final movement that Beethoven gives the listener a hint of brighter things. In performing terms, this is probably the most difficult of all the middle period quartets. Whilst the Cypress give us a good account, I find it a little strait-laced. For me the Belcea have a slight edge here: their performance is just that bit more driven. All in all, this is a good set, but not great. It is well presented with good booklet notes and excellent recorded sound. I feel however that there are better versions which go further towards the heart of the music. The Belcea do the music well on their complete set of the quartets (Zig-Zag Territoires ZZT344). However, for the most enlightened version I would opt for the Tokyo String Quartet’s latest version on Harmonia Mundi. I find it the most rewarding of all and even prefer it to their much vaunted earlier version.